Although K-pop has been an international phenomenon for two decades, debates about the precise definition of the term “K-pop” are still raging. It’s difficult to resolve because it is not always entirely clear what is so Korean about K-pop. K-pop is K-pop because it is music performed by (mostly) Korean artists, but what about beyond that? With “Idol,” the title track from BTS’s LOVE YOURSELF: 結 ‘Answer,’ BTS gives an answer of sorts. Although calling “Idol” traditional Korean music would be a stretch, it amply uses chuimsae [추임새], which means using an extra exclamation between lyrics to draw out audience reaction. (Some examples are the lines of “얼쑤 좋다” and 지화자 좋다” in “Idol”’s chorus.) Additionally, the music video for “Idol” features a traditional Korean building, in which the boys of BTS dance in the traditional Korean silk coats. BTS’s use of the traditional Korean elements, both in its music and in its visual presentation, is actually a rare quality. Since K-pop began its expansion in the early 2000s, it has attempted to blend into the local market. To that end, the first generation of international K-pop acts made no particular effort to appeal their Korean-ness, in an effort to expand their reach. In the international market, K-pop acts would release songs in English, Chinese, or Japanese, and speak the local language in the interviews, and they would source their music from leading Swedish composers. This was a marked shift from the methods of Seo Taiji and Boys [서태지와 아이들] — the group widely regarded as the fountainhead of modern K-pop, who made a point of incorporating aspects of Korean culture in their music. “Hayeoga [하여가],” the title song of their second album in 1993, was a mixture of Jamaican rap, heavy metal, and Korean traditional music. The title track from their next album, “Dreaming of Balhae [발해를 꿈꾸며],” was a song calling for unification of the Korean Peninsula, with the music video shot at the former Communist Party headquarters near the demilitarized zone. The effort to infuse Korean cultural and musical traditions to Western pop music traces all the way back to the origin of pop music in Korea. In 1974, Shin Jung-hyeon [신중현], Korea’s “Godfather of Rock,” composed his iconic “Beauty [미인]” in the Korean pentatonic scale. Famed guitarist Kim Su-cheol [김수철] was the first artist who consistently and systematically pursued the fusion between Korean music and Western pop, to a point that he became popular enough outside of Korea to to showcase his music in the 1988 Seoul Olympics and the 2002 FIFA World Cup, co-hosted by South Korea and Japan. The trend continues to this day with Korea’s indie bands like the Second Moon and Jambinai, whose rollicking, modernized rendition of Korean traditional music was featured in the closing ceremony for the 2018 Pyeongchang Olympics. Nevertheless, Korea’s idol groups and hip-hop artists have been reluctant to incorporate their Korean heritage into their music, the former because of the concerns over international marketability, the latter because of the concerns of presenting “authentic” hip-hop that hewed closer to what American audiences recognize. Yet even they made sporadic attempts to introduce traditional culture into the music. In “Shangri-La [도원경],” the idol group VIXX utilized the instrument gayageum [가야금] for its music, and included Korean outfits and accessories for its music video. The rapper Nuck [넋업샨] explored the marriage between Korean culture and hip-hop. His song, “Bulhandangga [불한당가],” a 2014 Korean Music Awards winner that was created with Naachal, P-Type, and MC Meta, was a brilliant modern take on jeokbyeokga [적벽가], one of the classic numbers in pansori [판소리], a form of narrative singing. Yet all of these attempts (except perhaps VIXX’s) were not widely heard outside of the Korean domestic market. BTS’s incorporation of Korean culture comes in a different context: They are a hugely popular international band facing a global audience. “Idol” came after BTS had already reached No. 1 on the Billboard 200. At a point where most previous international K-pop idol acts would try to blend in deeper into the local market — as BOA did after topping Japan’s Oricon Singles chart in 2003 — BTS chose to double down on their Korean-ness. BTS seemed to realize that they couldn’t be like preexisting K-pop idols, nor could they be like American boy bands. 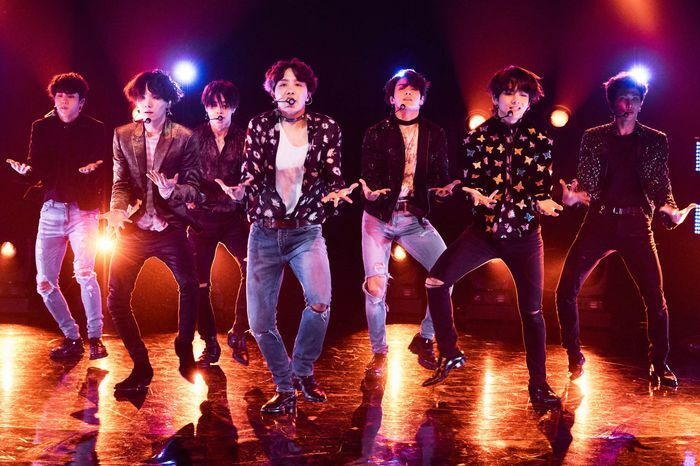 Prior to BTS’s massive Stateside success, it seemed that K-pop’s localization strategy had a ceiling in the U.S. market. Long after K-pop had already become an international sensation in the rest of the world, U.S. radio stations resisted playing K-pop songs regardless of the attempts to appeal specifically to the U.S. market. BTS was able to go farther than the previous K-pop acts by taking a different route: presenting an authentic representation of themselves that grew with their fans. Yet they still continue to face challenges in the U.S. market: structural barriers prevent them from receiving comparable official recognition. BTS did not receive a single Grammy nomination at the end of 2017. Jeff Benjamin, K-pop columnist for Billboard, suggested BTS could perhaps seek a Grammy in the category of “World Music” — an enterprising idea, but not entirely befitting the most popular boy band in the U.S. In this adverse environment, BTS’s turn toward Korean elements might be the right path to overcome the limitations of the localization strategy. (In fact, even the non-Korean parts of “Idol” are not all that Western, as they lean heavily on gqom beats that originated from South Africa.) It is also a statement of confidence about their Korean identity, regardless of what award committees may think. Comparing the music videos for Seo Taiji’s “Hayeoga” and BTS’s “Idol” gives an interesting glimpse into the evolution of the relationship between K-pop and U.S. pop culture in the past quarter century. The music video for “Hayeoga” begins in a club in Itaewon, a multicultural district in Seoul, with a group of African-Americans showing off their dance moves to the locals. One Korean clubgoer, feeling dissed by the dancers, calls in the help of Seo Taiji and Boys; the group show off their own moves, gaining the respect of the dancers. In contrast, the music video for “Idol” features Nicki Minaj. But BTS is not seeking Nicki Minaj’s approval, nor is Minaj there to teach BTS anything. They are instead engaged in an exchange, with Minaj liberally borrowing the Korean aesthetics in her segment by putting up her lyrics in hangeul script. Even as Seo Taiji boldly intermixed Korean music with Western pop, he recognized that in 1993, the American music industry was the ultimate gatekeeper of global success. In 2018, BTS is the world’s biggest boy band and that is no longer the case.